Henry Wood was born on the 19th of October 1894 in Hackney, London to bootmaker Alfred Wood and Hannah Jane Wood nee Fewster. Henry´s father Alfred Wood was born about 1850 in Hackney, London to bootmaker Thomas Wood. His mother Hannah Jane Fewster was born about 1853 in Westminster, London to shoe maker James Fewster. Alfred Wood and Hannah Jane Fewster married, by Banns, on the 25th of May 1874 at St John´s of Jerusalem church in South Hackney, Middlesex. At the time of the marriage, the couple lived in South Hackney and Alfred was working as a bootmaker. Henry had two siblings: Albert George born in the 2nd quarter of 1877 in Bethnal Green, London and Daisy Mary A born in the 2nd quarter of 1885 in Bethnal Green, London. 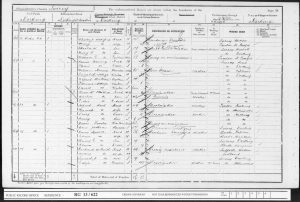 At the time of the 1891 Census, the family lived at 180 Hackney Road, Bethnal Green, London. Alfred was working as a bootmaker and Hannah was at home. Of their children: Albert was a marble paper apprentice and Daisy was at school. On the 23rd of April 1900 Henry was admitted into the Dorking British School, he had attended St Paul’s School before this. At the time of the admission, the family lived at 4 Rothes Road, Dorking. At the time of the 1901 Census, the family lived at 21 Rothes Road in Dorking. Alfred was working as a bootmaker and Hannah was at home. Of their children: Daisy was working as a dressmaker and Henry was at school. The family further comprised of a boarder, postman, John Jackson and a visitor James Tewster. At the time of the 1911 Census, the family lived at 66 Rothes Road, Dorking. Alfred was working as a bootmaker and Hannah was at home. Their children, Daisy was a tailoress and Henry an assistant grocer. The accomodation had seven rooms. Hannah Jane stated that she had given birth to three children. In 1915 Henry Wood married Mabel Gwendoline Brett in Victoria, Australia. Henry´s wife Mabel Gwendoline Brett was born in the 1st quarter of 1895 in Dorking, Surrey to jobbing gardener James Brett, born about 1854 in Blackheath, Surrey, and Philis Brett nee Killick, born about 1860 in Leigh, Surrey. 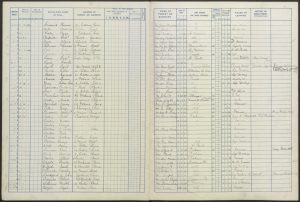 At the time of the 1911 Census, the family lived at 5 Mount Street, Dorking, Surrey. James was working as a jobbing gardener and Philis was at home. 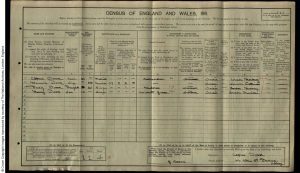 Of their children: Lily Agnes was working as a domestic servant, Mabel Gwendoline was a dressmaker and Reginald James was a scholar. The family further comprised of Jame´s brother in law, carter, Martin Killick. The accommodation had five rooms. Philis stated that she had given seven children of whom six were still alive. Henry Wood enlisted on the 15th of February 1915 into the Australian Army. He became part of C Company, the 22nd Infantry Battalion of the Australian Army. The 22nd Battalion formed part of the 6th Infantry Brigate. He was a Private with regimental number 712. At the time of his enlistment Henry was working as a tea blender and lived with his wife Mabel Gwendoline in the care of Mrs Sheldon, Thornhill, Penders-street, Northcote, Virginia, Australia. His religion was Presbytarian. Henry Wood embarked on the 10th of May 1915 from Melbourne, Victoria on HMAT Ulysses (A38) to Egypt. 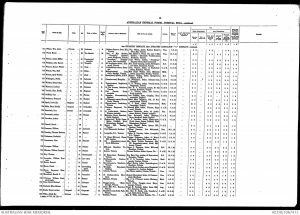 Henry´s last unit was the 6th Australian Machine Gun Company. Henry Wood was killed in an action on the 12th of April 1917 in France. His body was never found. He is commemorated on the Villers-Bretonneux Memorial in Picardie, France. Cemetery Villers-Bretonneux Memorial, Picardie, France.